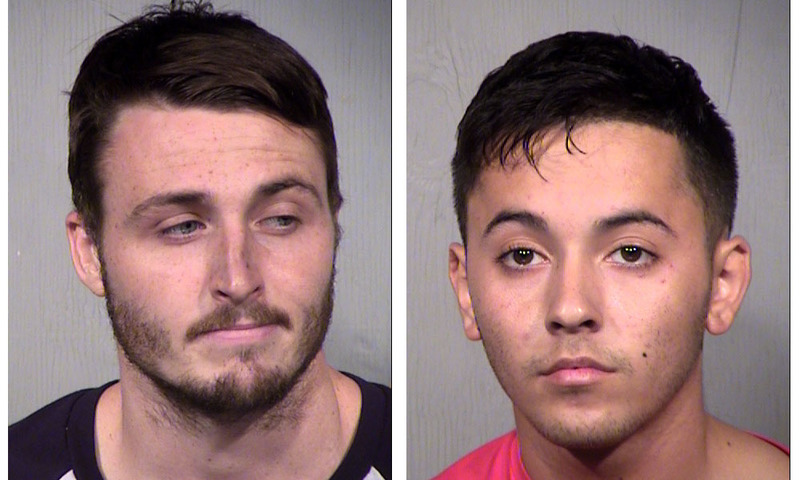 Detectives arrested two men from Maricopa in connection to a fatal accident that claimed the life of two other passengers in the Valley. The one-vehicle crash reportedly occurred Sunday at approximately 1:30 a.m. on southbound State Route 143 near the Interstate 10 junction. Maricopa resident Johnnie Verdoza, 21, and Carlos E. Monteverde Garcia, 25, from Sonora, Mexico, were killed in the wreck, according to DPS. The alleged driver, 22-year-old Thomas Robert Sikes, is facing two counts of suspicion of manslaughter and one count of endangerment. Sikes’ passenger, Bryon Jesus Carrillo, 21, is accused of obstruction of a criminal investigation. The heavily damaged 2015 Nissan passenger vehicle was discovered during the early morning hours of Aug. 19 by a DPS trooper responding to a report of an unknown injury crash. “After a walk though of the area, the trooper was unable to locate the driver of the vehicle or victims from the crash,” the DPS news release states. The bodies of the victims were eventually discovered hours later. At 9 p.m. Aug. 19, family members of one of the victims found the bodies approximately 50 feet south of the crash scene. The family tracked a cell phone signal to the location and reported it to Phoenix Police. The DPS report states the bodies appeared to have been concealed with foliage. The Pinal County Sherriff’s Office later notified DPS they received a call from Carrillo, a surviving passenger. Carrillo reportedly told law enforcement he and his friends were headed home to Maricopa after leaving a bar in Tempe at the time of the crash. The report includes Carrillo’s recollection of what came after the wreck. He describes climbing out of the vehicle and his unsuccessful attempt to locate the two friends allegedly missing from the car. Carrillo accused Sikes of encouraging him to leave the area together, according to the report. Later, Sikes’ girlfriend reportedly picked up the pair at a nearby gas station. None of them called emergency responders to report the fatal crash, DPS said. The girlfriend, 25-year-old Adriana Colin-Lemus of Peoria, is suspected of hindering prosecution. Sikes, Carrillo and Colin-Lemus and are being held in Maricopa County Jail.